Lenny Kravitz Takes Spiritual Turn on 'Baptism' Lenny Kravitz joins host Scott Simon to talk about his music and the recent album Baptism, on which the rock musician explores themes of spirituality and stardom. Kravitz is embarking on a tour that will bring him to venues across the U.S. starting in April. Lenny Kravitz joins host Scott Simon to talk about his music and the recent album Baptism, on which the rock musician explores themes of spirituality and stardom. "We live in a spiritual world and... [spirituality] has been an important issue in my growth," Kravitz tells Simon. "When I made this record, I was right in the middle of that." He grew up exposed to two faiths, with a Christian mother and a Jewish father. Kravitz plays nearly all of the instruments on Baptism, which was recorded in Miami and at the Hotel Edison studios in New York, where Duke Ellington once recorded. 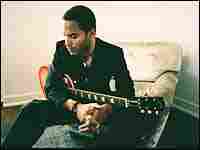 Though Kravitz has interacted with several heavy-wattage personalities in the music industry (including Ellington), he says he would rather focus on being himself and not getting caught up in being a "star." Kravitz is embarking on a tour that will bring him to venues across the U.S. starting in April.